SQL Injection is a very familiar for every penetration testers. SQL Injection or SQLi is a type of an injection attack which makes possible to execute malicious SQL codes. Those codes can control a database server. Attacker can use SQL vulnerabilities to bypass the security of a web application, and they can access the database of web server. This attacks comes in public in the year 1998 in a article in "Phrack" magazine. So we can call it very old vulnerability. New web applications are almost free from SQLi vulnerabilities. But their are billions of old websites are still have the fault in SQL. Anyone can easily find those websites using "Google dorks". SQL injection is a very easy attack, even a 4 year old can perfrom this with the help of some automated tool like haviz, but advanced SQL injection is not so easy but here we have a tool that make easy normal and advanced SQL injection quite easy. 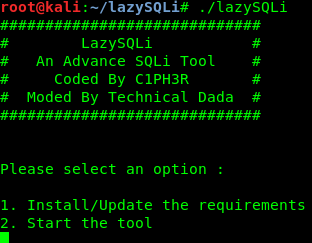 The name of the tool is LazySQLi. Now we are going to install the requirements by pressing 1, this is for first run only. This may take some time depending on internet speed. Here we can see lots of types are sql injections are available, normal injection and advanced injection are supported. Enter our choice (type of injection) and enter vulnerable website and then the automated script will RUN.